Installing Nosto on your Magento site is simple and done by using extension following these steps. Download the Nosto Magento extension from Magento Connect. Enable Nosto features and go live! For more detailed information (for developers) on our Magento plugins, please visit our Github for Magento 1 and Magento 2. Log-in to your Magento Admin and navigate to Magento Connect manager to install Nosto extension. Alternatively, you may install the extension by using command line, but in this guide we cover steps how to install Nosto by using tools available in Magento’s web-admin. Download Nosto Magento extension and install it on your Magento by selecting upload and install, which will run the extension package in your Magento setup. Uploading and installing Nosto extension will not yet enable data exchange process between your site and Nosto and doesn’t enable any of Nosto’s features. Once package has been installed successfully, flush your Magento cache and proceed to the next step and connect store views to Nosto. Each store view typically represents a localised web-site version or entirely different store with separate selections on Magento. Nosto supports the structure by utilizing separate Nosto accounts for each Magento store view. Consider a Nosto account as a similar view to your website, its selection and visitors, which a Magento store view represents. You may have the same Nosto setup on all of your store views, but most likely as localized site views are in different language, you can and should customise the setup for each. This is done by connecting a store view to separate accounts at Nosto. In case you have only one store view, you only need to connect your website and one view to Nosto. Connect a store view by selecting Nosto menu in the top bar. Proceed by selecting a store view, which you would like to connect to Nosto. The connection wizard will ask you a couple of questions about you, your store and its inventory before the connection is established. Connection steps will also open a Nosto account or require you to connect to an existing one. 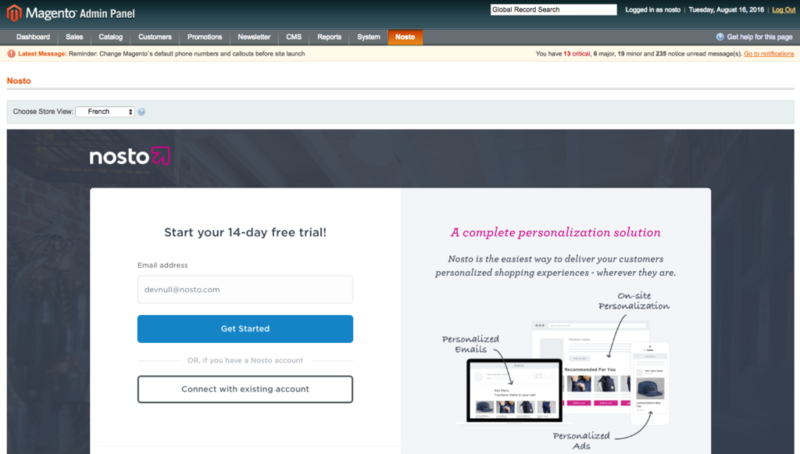 The first view asks for your email address or prompts you to connect to an existing account, in case one has been created to you already by the Nosto team. The email address that you give here is later used to log-in to the Nosto admin panel as a primary user and owner. If you already have a Nosto account, click connect with existing account which will prompt you to log-in to Nosto. In the next view, select a Nosto account which you already manage and connect it to the correct store view. Once you’ve added your email address the wizard asks details about your setup. Select Test Nosto on my dev/staging store, if you are installing Nosto on a local development environment or any kind of staging/dev environment. This will open a free test account and connect it to your staging. Note that test accounts can’t be used for production purposes, but your staging account can be cloned as a production account by Nosto’s support. Read more about test- and staging setups in the next chapter. Connecting a store view to Nosto enables the data exchange process, meaning Nosto starts monitoring your site’s traffic, purchases and customer behaviour online. Connecting a store view doesn’t automatically enable any of Nosto’s features or make any visible changes on your site itself. All features are enabled later on from the Nosto admin panel. When a store view is successfully connected to Nosto, we automatically generate a replica of store view’s product catalogue in our service and keep it up to date. During the first connection, we also import anonymous purchase history of past month. 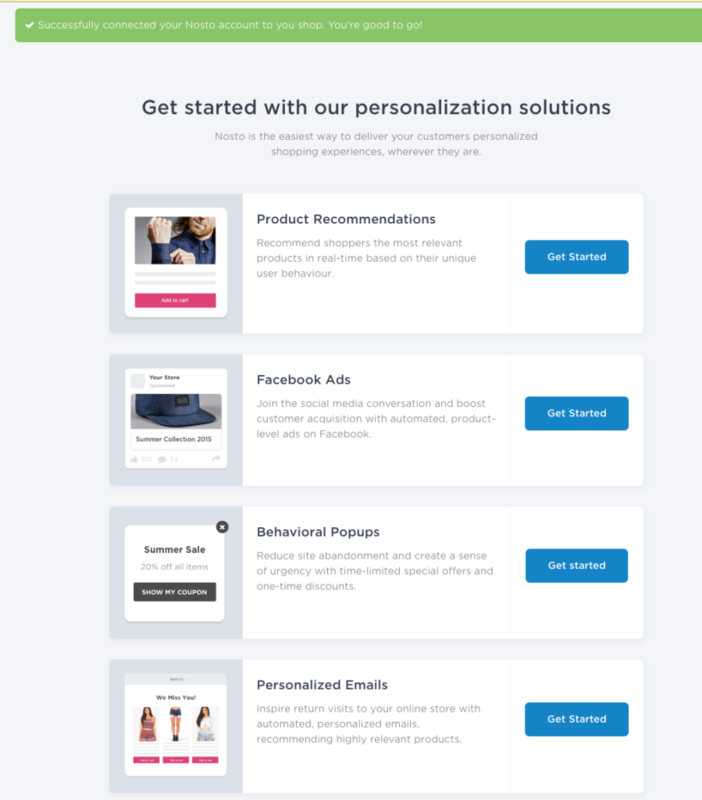 We don’t import personal data of customers who bought from your store when you connect, but only product data or what was sold so that you could start using Nosto features as soon as possible. Technically this is done by processing the order data or in other words by analyzing which products have been commonly bought together. When the connection is successfully established, we start tracking names and email addresses of customers who bought from your store or access their account (login/registration), but you can opt-out from this by switching it off in the plugin configuration in the Magento backend. We don’t collect other personal details such as delivery addresses, phone numbers or collect any payment card information, whereas email addresses are only used for Nosto’s email features and only on your store, should you like to utilize Nosto emails later on. When you’ve successfully connected to your store view to Nosto, you’ll be directed to a landing page which directs you to the correct area in the Nosto admin when you want to enable Nosto’s features. Before you actively enable one or more of Nosto’s features, nothing is yet publicly live and shown on your site. Nosto encourages test-installations in a separate environment before installing Nosto extension in a live Magento production environment. However, as Nosto lives out of behavioral data and assumes also test environments are accessible from the Internet, few limitations how Nosto setup can be tested exist. Read more about implementations on test environments here. For development purposes, always use a separate test account, as otherwise data and links referring to your test environment might end up to a live site. 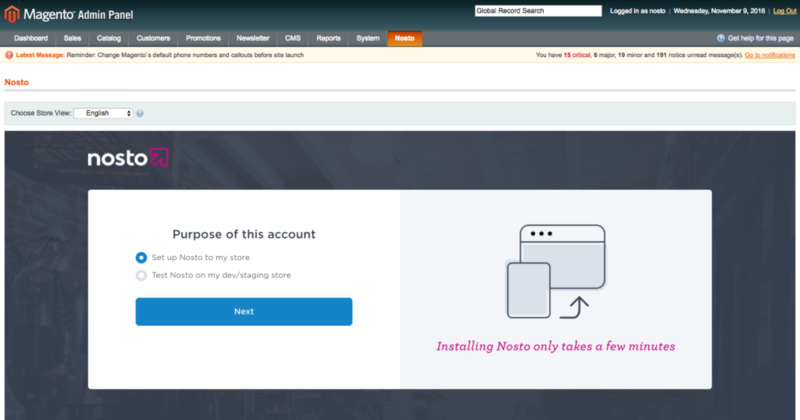 If you need to re-connect store view to another Nosto account or simply want to disconnect Nosto, click settings menu in the Nosto Magento admin under the correct store view. Under the settings, click remove Nosto. This’ll disable permanently terminate data exchange process from the selected store view until you re-connect the store view again to Nosto. You need to disconnect your account first for example when you need to re-connect another Magento storeview to the same Nosto account. Removing Nosto under Nosto admin will only disable data exchange from selected store view, but won’t remove the Nosto extension itself. If you need or want to remove extension entirely from your Magento instance, follow your IT-procedures or contact your Magento integrator to remove the extension following their practices. The Nosto Magento extension adds two different kind of hidden blocks to selected page types. Tagging blocks add the necessary embed script, which enables real-time data exchange between the site and Nosto, and the hidden meta-data blocks (known as tagging blocks) which include the context of the page or a product in a format which Nosto can read. If the site’s layout is heavily customized and doesn’t use Magento’s default page elements, the blocks must be added manually to the correct places. This is done manually by configuring nostotagging.xml configuration file. Note that if required tagging blocks featuring script and meta-data are removed or misconfigured implementation might not work accordingly. The other block type consists of Nosto recommendation element blocks. The extension adds altogether 14 default Nosto elements which will display actual recommendations for site’s visitors when the recommendations are enabled. Visibility and design of the element blocks are controlled and configured on Nosto’s admin panel. Read advanced guide to learn how to permanently remove visible Nosto elements by adjusting blocks, but be aware that this isn’t necessary procedure as each any recommendation element can be dynamically disabled from Nosto’s admin panel if it is not actively used. Extension also has a built-in support for Nosto’s Products API. In practice this means that when a new product is added in your Magento product management, extension automatically pushes product data to Nosto. Extension also covers updates applied to products when changes are applied in Magento’s product management. For example, when a product is removed from catalogue or selling price is adjusted, extension updates data in Nosto’s index few seconds after changes have done in Magento. Support for dynamically mapping attributes to tags is available from version 2.7.0 onwards. Product attributes can be stored to tag fields 1-3 in Nosto’s index. Attributes can store any additional product attributes applicable for your business and store. Configuration is done in Magento admin under System > Configuration > Services/Nosto > Store view. Select one or more attributes under view Attributes to Tags to map attributes to reserved tag-fields and save configuration. In order to fully utilize Nosto’s recommendation filters, we recommend storing only one attribute in each tag field, but technically you can select as many as you want. Note: Toggling this feature will require you to request Nosto to do a full reindex and the product catalog may be out of sync. Brand by default maps a manufacturer property. However, if brand detail is stored in other property in Magento, it can be changed by selecting another property in Magento admin under System > Configuration > Services/Nosto > Store view > Brand by selecting other attribute from the dropdown menu. By default and as a recommended configuration, Nosto maps the base image of a product displayed on product pages, but you may change this to a smaller image version under Image options view by selecting another image version. Support for “clean” URLs has is available from version 2.7.0 onwards. Enabling this feature, will allow the extension to omit the training ___store query parameter. Note: Toggling this feature will require you to request Nosto to do a full reindex and the product catalog may be out of sync. Multi-currency setups are supported from extension version 2.8.0. In case your site uses multi-currency i.e. customers may select from multiple currencies the preferred one to view and pay their purchases use or upgrade to extension version 2.8.0 or later. From Nosto extension version 2.9.0. support to append optional product attributes Nosto tags easily and directly from the Magento admin panel. GTIN: As above, map global trade item number to Nosto to enable omni-commerce product merge. Ratings and Reviews: As above, but under Ratings and Reviews (R&R), map your ratings and reviews to Nosto selecting the technology you use for R&R. Advanced users may extend the functionality of the extension and modify what data is sent to Nosto. This is done by creating a small Magento extension for extending or altering the product data that is sent to Nosto. Read technical guidelines here. If you’re using Magento Enterprise’s built-in cache or other cache (FPC) on your Magento, read from our Github wiki what to take into consideration.